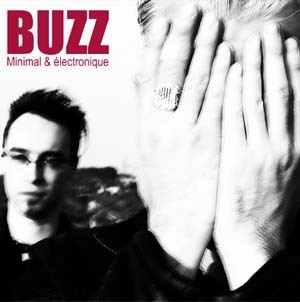 French electronic act BUZZ have returned with their follow-up to 2007's Les Musiques Nouvelles. Minimal & électronique is the 19-track self-produced and self-distributed answer to the growing question: "What will artists do without record labels?" It can be ordered at their official MySpace page http://www.myspace.com/buzzbiz by sending them a message there. But can an independent album make an impact on the ear? No waiting for a special edition re-issue, this album includes everything with original tracks, remixes and experiments leading you towards the title track. Ever notice how most times an album leads with the title track instead of taking you on a journey towards it? This disc does just that. The title is an obvious reference to the Veronica Vasicka hosted East Village Radio series Minimal-Electronik Plus (a podcast series featuring electronic artists of the mid-80s.) The track features the host and a second track included on the disc is titled "East Village Radio." Both are featured in several different mixes on the album including the ambient yet jazzy "East Village Radio (Dirty Sweet Project remix.)" But I believe the whole album leads you to the finale. There are several stand-out tracks here that don't get the remix treatment and are possibly better for it. "Petite Poupée Japonaise" has an upbeat piano line that leads one happily through the etheric vocals and darker undertones. "Je Suis Avec Toi" lures you in with a strong bass synth line and drum machine combo as the vocals (literally meaning "I am with you") mesmerize. "Parce que je n'ai pas d'âme" is possibly the most emotive vocal performance on the disc paired with syrupy keyboard hook amidst spacy textures. Also notable are the very sensual "Viel Zu Modern!," energetic "Belles Comme des Bouddhas," "Sérénade Pour Un Renégat" (which features Renegade Soundwave's Gary Asquith) and "God Bless America" (which contains samples of President George W. Bush's post-9/11 State of the Union speech.) I can't say there are any problems with the remixes. The choice of remixers is strong and the mixes are spread throughout the disc as to avoid repetition or overkill. I remain impressed with the near gothic entanglements of "Orange M. (Néolymb remix)" while vocally Jean-Christophe seemingly channels a French Falco. I've been impressed with many albums that have had touches of French vocals (from Camouflage's Methods Of Silence to Enigma's MCMXC AD) but I can't say that I've wanted to search the terms so readily until now. The mood set by the tones of the music and lyrical evocation express enough to by-pass any language as it speaks tomes to the ears. There are few that will not appreciate Minimal & électronique at least on some level but fans of electronic music, independent music and strong production will rejoice.